A selection of noteworthy murals around the city. Madeline creator Ludwig Bemelmans painted the beloved murals at Bemelmans in the Carlyle. Spot the ice-skating elephant, rabbits at a picnic, and a self-portrait of the artist. Grandson John Bemelmans Marciano continued the family legacy with new Madeline books. Everett Shinn's murals at the Plaza's Oak Bar got an extra bid to immortality since they provided the background in a key scene early in "North by Northwest." The Oak Bar and the Oak Room are scheduled to reopen in the fall. 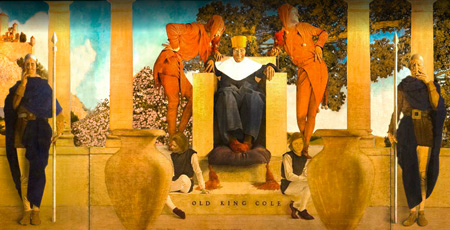 Maxfield Parrish's Old King Cole was originally in the Knickerbocker Hotel, but seems at home in the King Cole Bar of the regal St. Regis. And yet, there's some low comedy afoot: the king, who bears a suspicious resemblance to John Jacob Astor, is depicted at the moment of breaking wind. Almost a century ago, West 67th Street was an artist's enclave and the street's cafe, now The Leopard at des Artistes, was their meeting place. Howard Chandler Christy, an artist who lived upstairs, created the frolicking Christy girl, a 2.0 version of the Gibson girl. Upstairs at "21", you'll find Brooklyn artist Wynne Evans' delightful murals, set in the 1930s, depicting Rockefeller Center in spring, summer at Bethesda Fountain, fall at Grand Army Plaza, and winter in Times Square. Jefferson, Lincoln, FDR, and Einstein are the subjects of the Seward Park Murals by Hugo Gellert. The surgery center at New York Hospital has a vibrant NYC cityscape, courtesy of Aspen Murals. Labor and commerce have never looked quite so beguiling as they do on the walls of the murals at the Woolworth Building lobby. 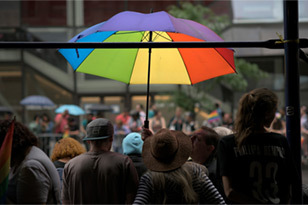 They can be seen if you take one of the building's tours. Labor and commerce inevitably clashed when Diego Rivera was hired to do a mural at Rockefeller Center and the artist decided to slip Lenin into the mix. Man at the Crossroads was destroyed in short order. Arsenal at 5th and 64th. On a handball court wall at 128th and Second Avenue, Keith Haring painted Crack is Wack in 1986. It's now part of the Crack is Wack Playground. Among our favorite murals in the city are Max Spivak's The Circus and The Grand Finale of an Opera at the Queens Library, Astoria Branch. Two of the original five have been restored and are now on the library's main floor. The other three were destroyed. In March, another Spivak mural made a brief return in midtown. Alfred J. Tulk was prolific muralist from the 1920s to the 1908s. His District School mural is on the building exterior at 3rd Avenue and 120th Street.